Spain ruled the Netherlands at the time and the Spanish Inquisition had no mercy for the Anabaptists, who believed in baptizing only adults upon confession of faith, refused to bear Spain ruled the Netherlands at the time and the Spanish Inquisition had no mercy for the Anabaptists, who believed in baptizing only adults upon confession of faith, refused to bear arms, and insisted that the church and state be separate. The Martyr’s Mirror documents many gruesome events that took place in the Spanish Netherlands. Over 1,200 martyrs sealed their faith with their own blood in the region. Of these, three-fourths were Mennonites. The severe persecution caused the Anabaptists to look for a place where they could live their faith without the threat of torture and imprisonment. To many Mennonites, Poland seemed to be the answer. A huge number of the Polish population had been wiped out by the plague. Rich farmland in the Dazing region along the Baltic Sea was flooded and in ruins. This appeared to be a land of opportunity and a large number went there by boat from the 1530s to 1600. Dutch businessmen hired the Mennonites to build dikes and to drain the lowlands along the Vistula and Nigot River deltas in northern Poland. This was not new work to the Mennonites, who were used to building dikes in Holland. Draining the land, which was from three to seven feet below sea level, was no easy task. Swamp fever was a serious problem and over half of the first settlers died. With time, the swamps were turned into rich farmlands. Because of their valuable contribution to the country, the Mennonites enjoyed limited freedom in their early years in Poland. However, they were not granted citizenship rights nor were they allowed to build their own church houses. The Mennonites met at their homes, where services were held in the barns and sheds. During this time the bishop, ministers, and deacon leadership was organized. 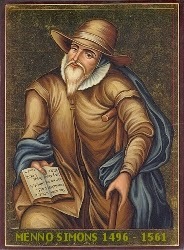 Menno Simons visited the region in 1542 to help resolve a church dispute. By now the several Polish surnames like Sawatsky, Rogalsky, and Pankratz were found among the Mennonites. Not enough land was available to support the growing farming communities, and many Mennonites became merchants, weaver, and artisans. War broke out, and in 1772 the country of Poland was divided among Prussia, Russia, and Austria. The Mennonites were now under Prussian-ruled government, laws were passed to keep them from purchasing more land. Military exemption was granted only after large cash payments were made. The state did not recognize the Mennonite ministry and did not allow them to preach on public grounds. This meant a Lutheran minister would have to attend Mennonite burials, as the cemeteries were public ground. To avoid this, some Mennonites established family burial plots in their front yards. Neither did the state recognize marriages performed by the Mennonite ministers. Unreasonable tithes were demanded by both the state and Lutheran Churches. For many Mennonites, it didn’t appear as if Prussia held any future for their church. It was time to seek another country, as their ancestors had done over two centuries earlier. In the late 1780s, when Catherine the Great invited them to farm the steppes of the Ukraine, many Mennonites felt that God was answering their prayers. Click here to continue reading Part two: Low German Mennonite History. From Poland to Russia the Ukraine.